Picnic Tables are perfect for any outdoor space. They create a welcoming and inviting area to socialize and gather with friends and family. Paris picnic tables feature expanded metal table tops and seats to provide you with the best solution for your space. The 4 ft. Diamond Green Commercial Park Square Table from Ultra Play features a 46-inch square design with a standard umbrella hole. The tabletop planking has a diamond expanded metal pattern with thermoplastic coating for exceptional durability. Featuring an MIG welded, walk-through design, the powder-coated frame measures 1-5/8-inch with 1-1/16-inch O.D. bracing. For assembly convenience, the table comes with all stainless steel hardware. The 358 is a ADA 46" table with 1-5/8" walk through design frame. Umbrella hole is standard. The 46" single pedestal 338 table has a 4" x 4" square center post with 2-7/8" O.D. support arms. Umbrella hole is standard. The 358 is a 46" table with 1-5/8" walk through design frame. Umbrella hole is standard. 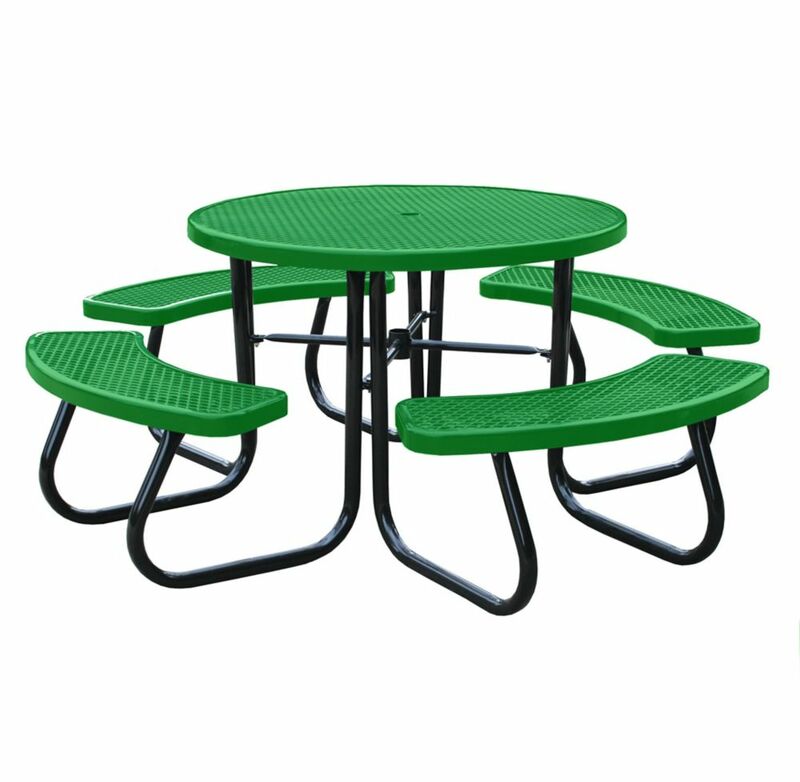 46 inch Light Green Picnic Table with Built-In Umbrella Support Picnic Tables are perfect for any outdoor space. They create a welcoming and inviting area to socialize and gather with friends and family. Paris picnic tables feature expanded metal table tops and seats to provide you with the best solution for your space.